Diet Plans for PCOD in Delhi, Diet Chart for PCOD in Delhi, PCOD Diet Counseling in Delhi, Dietitian for PCOD in Delhi. Polycystic Ovarian Syndrome (PCOS/PCOD) is a growing epidemic among Indian women and women around the world. PCOS occurs when a woman doesn't ovulate, which causes a disruption in the normal, cyclical interrelationship among her hormones, brain, and Ovaries. PCOS/PCOD is a condition caused by a hormone imbalance and insulin resistance which can lead to symptoms such as weight gain, excess body hair, acne, absent or irregular periods. Symptoms and severity differ from person to person and you do not have to have the presence of ovarian cysts to have the syndrome. 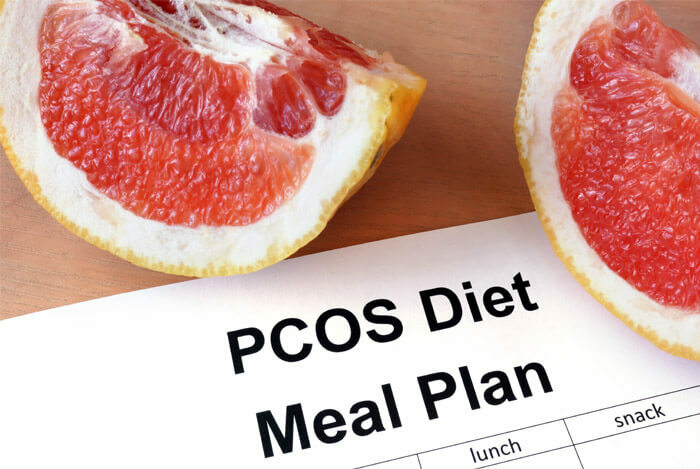 Plan Your Diet to Control PCOS/PCOD. Balance Your Diet in advance should help you get more balanced when it comes to eating times. You’ll also have all of the ingredients you’ll need to prepare a healthy, nutritious meal that will help you get your PCOS/PCOD under control. Losing weight is one of the best natural controls for PCOS.Whether obesity is a cause of PCOS/PCOD or obesity is a result of PCOS is unclear. PCOS is not 'cured' by weight reduction, but the symptoms of PCOS/PCOD tend to be lessened by Weight loss or increased by weight gain. Stay away from food which consists of soy such as dairy products. Try to make sure you consist of fruits and veggies in your diet. Choose fruits and veggies which are harvested naturally in making certain there are no chemical substances in them. Avoid consuming meals of which consists of saturated fat and also limit your consumption of fatty food whenever possible. Drink more water: Drinking plenty of water is crucial if you have PCOS/PCOD. It helps to keep hormone systems working. Water helps to lubricate parched tissue and helps fiber in your food well and perform its function. Fresh fruits and vegetables: Fresh fruits and vegetables are good foods for PCOS/PCOD, although sugary fruits and starchy vegetables should be eaten in moderation if you suffer from yeast infection. Leafy green vegetables: Leafy green vegetables such as kale and cabbage are great natural remedies for polycystic ovary syndrome and women who eat them on a regular basis have less incidence of PCOS/PCOD.